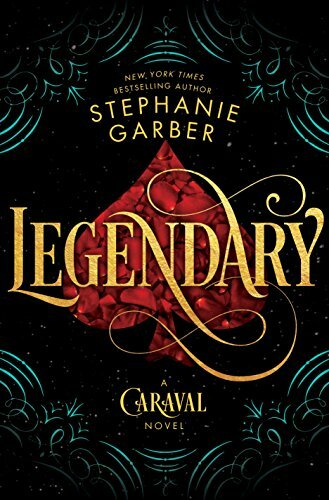 Stephanie Garber’s Legendary draws us deeper into the dark, seductive, enchanting world of Caraval — a mesmerizing game of dreams and nightmares, where reality and fantasy blur. This time, we follow Donatella Dragna, Scarlett’s younger sister, who must win Caraval if she is to save their mother and fulfill the desperate bargain she’s made with a mysterious stranger. Before Caraval even begins, however, Tella is thrust into another situation which imprisons her, and she must figure a way out if she’s to be free from all entanglements and be alive at the week’s end. But once the magic of Caraval comes to life, it seems different, more sinister. Word on the street is that this time the game is real, with dangerous consequences that could upend all of their lives. Tella must soon make a choice between fulfilling her bargain and betraying the boy she’s come to love, or saving them all from an ancient evil and losing her mother and possibly her life, as a result. The stakes have never been higher. Written in Garber’s lyrical style, the world comes alive vividly, expanding to Valenda — the empire’s capital city. It’s here the game of Caraval unfurls, against the mythical backdrop of terrifying gods and goddesses battling for an ancient power. Themes of love, betrayal, family and forgiveness are explored as the narrative ratchets up the tension toward a conclusion that will leave readers clamoring for more. Fans of Caraval will love it, and new readers will be enthralled by this immersive and imaginative world.